A few weeks ago I had coffee with a couple of bloggers at a local eatery. We chatted, very animatedly, about blogging and the blog industry. In mid convo I spotted two young ladies, sitting close by, mocking us openly. “Oooh she bloooogs!” I heard them jeer, judging us from a distance. It kinda pushed me over my chill limit. I mean, it’s not the first time that I hear a bunch of snotty comments being thrown at bloggers and social media influencers. But this time it was right there, all up in my grill, and it made me want to reconsider why I blog. Heck, why do it? 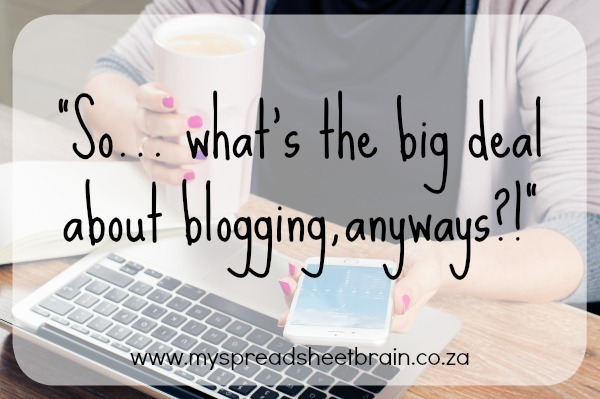 What does this “blogging thing” even mean? There’s a blog for just about everything. Want to learn something techy, there’s a blog for that. Want parenting advice? Travel guides? Want to learn how to make your cat feel loved and appreciated? There’s a blog for that. Ever Google “how to make angel wings out of a wire hanger”? You probably ended up clicking on a blog link. Our pleasure. But why do we spend hours editing pics to perfection, typing out well-worded articles and making sure it gets shared to social media? Hey, you do it too when you update your Facebook status with a rant or a recommendation. It’s just that mine is a little bit longer and more effort. Typing up a part of my heart message is my way of sharing things that I’ve learnt with other women going through the same thing. My parenting fail could show another mum that she’s not the only one struggling. And publishing a victory post might inspire someone, near giving up, to hold on just a little bit longer. I know of a brave mommy blogger who used her platform to share about the loss of a child. No one asked her to be so transparent it hurt. But those who were dealing with the same situation were thankful that she did. Blogging has also evolved into a business. And, well, considering all the time and effort we put into logo design, sourcing images, building up and maintaining our sites (and the beat goes on) …paid campaigns are definitely most welcome! (I have a lot of children, remember?) Product reviews are interesting (hello free stuff! right?) but sometimes it gets pretty tedious to write. 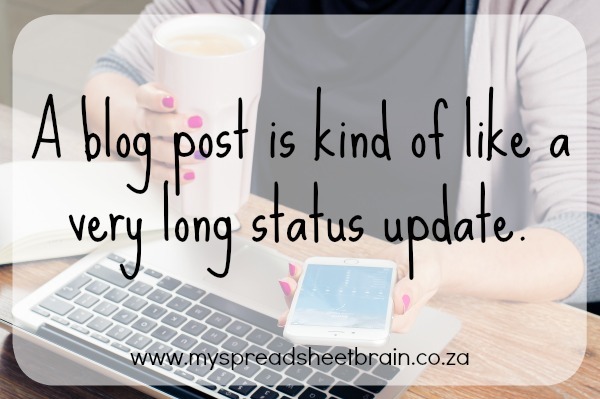 So yes, a lot of work goes into your average blog post. But, for the sake of our valued readers, we WANT to share what’s hot and happening with you. We WANT to give you our honest opinion on how the thing works (if it works), before you trek all the way to the shops for nothing. We value our audience and WANT to provide content that is NEEDED. It’s more than just a building up of egos. And it’s definitely more than just wanting to be famous. It’s a service. So that’s why i blog. And, in a nutshell, I’ve decided that I’m okay with being a blogger. And, well, if you still aren’t okay with bloggers, then try Googling: “I don’t know why I feel the way I do”. Maybe someone wrote a blog post about it. What an eye opener of a post! I couldn’t agree more Luchae. I love my blog and I’m going to keep blogging for as long as I can. Again, great post! This is so true…. And so so many people get flack (including me) it’s probably part of the reason I’ve taken so long to start again… Sad hey. Why does it bother people what the next one is doing even? I mean really …. Stay in your lane thanks for this! Viva bloggers!!! Ya man, we are important! Lol 🙂 Don’t stop writing and sharing! Oh my word! I can only assume you didn’t let Miriam and I know what was happening because we would have gone all “b*tch don’t even!” on them. Good call! Bwahahaha it was at the coffee meet up with Sarah, Heather and Cassie! If you guys were around, there would’ve been a straight up scene! Whoa! People mock bloggers? I did not know this, how rude! Keep doing what you love and keep them post coming! You know, I was thinking about this, and I figured that mayyyybe it’s only people who come from smaller towns/cities who don’t understand the concept of social media influencing. I mean, if you check out the blogs in the States, they are pretty well received! BOOM with that last sentence. This is unbelievable though, from real life adults? I can only imagine my reactions now I’m done studying and will be focusing on this! yeesh! Good luck Julie!!! Kick butts and take names! I must admit, I am very embarrassed about blogging. Somebody asked me: Who made you an expert on makeup all of a sudden? People are so rude. I don’t really share my blog or make it known I blog, but I am trying to get out of my shell more. Another blogger said almost the same thing. I don’t get how people can crit you basically saying you’re not “qualified” enough to be YOU… when they are kinda self-proclaiming that they are qualified enough to be the JUDGE of you! Bah humbug! Loved this post! So well said!